What's Wrong With Twitter Feminism? <a href="http://feministcurrent.com/author/meghan-murphy-2/" title="Posts by Meghan Murphy founder of The Feminist Currant, has pissed quite a few people off with her latest post "The Trouble with Twitter Feminism." In it, she details the problems she's encountered while engaging with feminists on Twitter, and expounds on why she thinks "Twitter is a horrible place for feminism." "Twitter feminism is all about hashtags and mantras. We all compete to make the most meaningful, (seemingly) hard-hitting statement in order to gain followers and accolades. Invent the right hashtag and you can become a feminist celebrity. While I’m not excluding myself completely from this phenomenon, as I do participate from time to time, I find it all a bit empty." But to reduce the presence of feminism on Twitter to a shallow quest for notoriety, you'd have to work really hard to ignore women of color, whose meaningful Twitter conversations and activism became the stuff of 2013 "Best Of" lists. Weigh in. 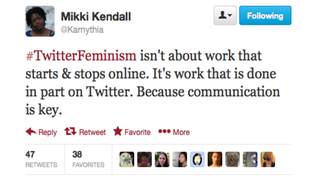 What you think about the #TwitterFeminism debate? Tweet us at @TheRoot247.